Arrange bacon on baking sheet and bake for 15 minutes or until crisp. Cool and crumble. In a mixing bowl, combine eggs, salt, pepper, crushed red pepper and cream, whisk until incorporated. Pour egg mixture into heavily greased muffin tin. Fill muffin cups ¾ full. 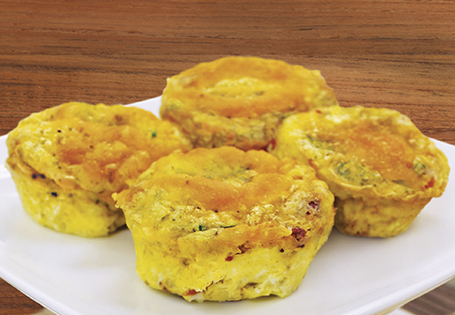 Spread a layer of bacon, green onion and cheese into each cup. Bake 15 minutes or until egg has set and reached a minimum of 160°. Remove from oven. Cut around each quiche with a paring knife to loosen from pan.